The sun is shining, graduation caps are flying and summer vacations are beckoning. As attention wanders to the world outside the window, what better opportunity is there to engage students with fun digital storytelling projects? We’ve got awesome new features for you and your students to try when you step outside including the expansion of our powerful green screen capability, now available for all your iOS devices. If you are already looking ahead to next year, you’ll appreciate some of the inspiring programs and ideas showcased in our features stories. Be sure to read about how students ages 9-13 all came together for an amazing project about the Great Fire of London. Be inspired as you find out how your students can get involved in putting an end to human suffering through the USC Shoah Foundation’s IWitness program, which makes WeVideo digital storytelling tools available free to participating students. And, if you are headed to San Antonio for ISTE 2017, be sure to read on for the latest about all WeVideo’s plans for the big show, from demos and giveaways at our booth to our expanded partnership with Microsoft as a premier member in the new Microsoft Apps for Education initiative. The USC Shoah Foundation - The Institute for Visual History and Education uses engaging, immersive digital storytelling projects to motivate students to act responsibly and to help them uphold important values including justice, equality, diversity, tolerance and how best to counter attitudes and acts of hatred. WeVideo video editing is embedded in IWitness’ digital platform and is available to students and teachers participating in its many video activities. 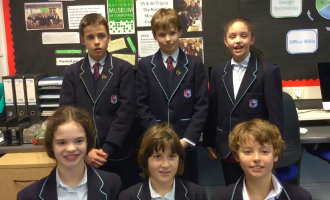 Students at London’s Knightsbridge School recently used WeVideo to transport themselves through time and space as they learned about, and virtually experienced, London’s Great Fire of 1666. Read about how students not only created an impressive video, but did so while achieving the more important result of getting to know their city’s history and recognizing the lasting impact of this infamous event. 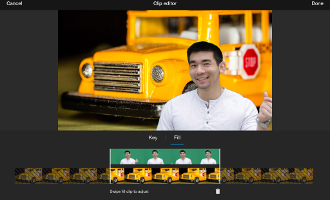 Now students can knock out a color from their video and replace it with, well, anything! Imagination is the only limit as subjects are magically relocated to exotic locales, the depths of space, or anywhere else they can imagine. WeVideo was extremely honored to be invited to be one of the premier solution providers in the new Microsoft Education Apps store. 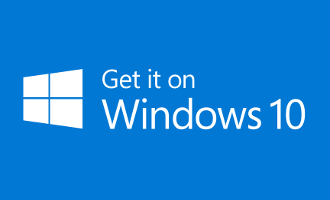 Now it’s easier than ever to bring WeVideo to your Microsoft-based classrooms. ISTE 2017: WeVideo will be at ISTE in San Antonio from June 25-28 with a green screen, very fun giveaways, and swag. Make sure to stop by booth #3045 to meet the WeVideo team and get a very special surprise! Motion Titles: Last month we introduced a new feature that lets users create meaningful videos with engaging and informative animated text and graphics elements. Learn more about it by reading this blog post if you haven't already! Youth Film Challenge: The Civic Life Youth Film Challenge invited college and high school students to submit short films about a pressing civic issue of their choice. Judged by a panel of luminaries including Bill Moyers, Dan Rather, Keli Goff, Judith Davidson Moyers and others, the program yielded truly remarkable results. WeVideo is proud to have sponsored this event and congratulates all of the participants. See their stellar work here. You received this email because you are subscribed to Marketing Information from WeVideo.